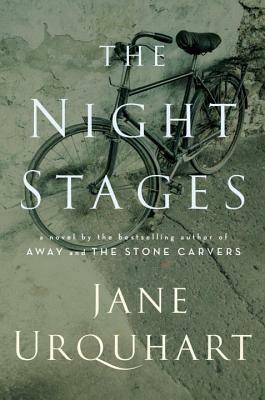 The Night Stages was my first Jane Urquhart novel. I know. However, I do own Away (the novel she is perhaps most known for writing), and also The Underpainter. The Night Stages was sent to us by Random House Canada and we are, as always, most appreciative of receiving their published works to read. The Night Stages certainly did fulfill my wishes for a lovely read, and certainly the beautiful prose held within lifts you away in almost a dreamlike trance. The exquisite writing is what will definitely have me reaching for the two other Urquhart novels I own, and hopefully sooner rather than later. It is also a very unique storyline, or at least it seemed very unique to me. The story is predominantly about three-four people, Tam, Niall, Kieran, and the painter Kenneth. The story opens with Tam flying to New York but having to touch down in Gander, Newfoundland due to extreme fog. Here, she is grounded for three days in the airport. We don’t know much about Tam, only that she seems to have fled from her lover, Niall. As the story continues, we hear more about Niall and his brother, Kieran. Niall is on a search to find his long lost brother and much of the story is around Kieran and his impetuous, highly hot tempered behaviour and his penchant for violent outbursts. Interwoven with this story is a completely separate one about Kenneth Lochhead. Kenneth is the man that has painted this large mural hanging in the Gander airport. It is this mural that Tam spends her days trapped within contemplating. So, there isn’t really too much shared about Tam, outside of the fact she is grounded in Newfoundland and is reflecting on Kieran, the brother of the man she was having an affair with. Niall has been sharing with Tam his obsession with trying to locate his brother. We then start to hear the story of Kieran and a little of Niall. Their mother dies when Kieran is very young, his birth didn’t necessarily kill her, but the trauma surrounding it caused her to become addicted to pain killers and later commits suicide. Following her death, Kieran’s outbursts become more intense and his father, and the school can no longer control “the darkness inside”. The only woman that can tame Kieran is the woman that comes to cook and clean for the family. She offers to take Kieran under her care, giving the father a much needed respite. While living with Gerry-Annie, Kieran develops a fascination with bikes. Often bikes are left against the stone wall outside of Gerry-Annie’s yard (these are left by the men that leave Ireland in search of work). Here, is where I will pause to share my delight with the book’s cover design. Here is someone that took the time to read the book and placed on its cover a well-suited image. He takes to riding them all around the village and meeting the people there. He is also developing a life outside of the shadow of his brother Niall. Niall is the all-around great guy – he’s the greatest athlete, he’s the most popular, he is the smartest and Kieran feels he is constantly unable to live up to the expectation for greatness like his brother, by their father. The longer he is away from home, and Niall, and his father’s praise of Niall, the more distance he puts between his life with them. Breaking into this story of Kieran (which is a very enjoyable part of the novel to read, perhaps the most enjoyable part), is the storyline surrounding Kenneth Lochhead and how he came to paint the mural hanging in the Gander airport. After sometime however, this section of the story seems to become unnecessary and distracting. Also becoming very unnecessary is the character of Tam. Why is she telling us this story? She has never met Kieran and only knows the details Niall shares with her. She becomes increasingly disappointed in Niall and eventually decides to leave him. But really – why include this character? Why not have it come from Niall’s perspective. Certainly he never becomes a fully realized character, much like the character and story of Kenneth, the mural painter. So from here, from the middle to the end is where this story, while highly original in the beginning, becomes rather tedious. The Kenneth storyline seems more like an intrusion or a nonsensical addition to the story, Tam becomes quite unnecessary and turns into this whiny and needy woman desperate for Niall’s attention. She longs for his attention to be more directed to her and not about the hunt for this long-lost brother. As well, we’re really launched into some tedious detail details about this bike race coming into play. Both Kieran and Niall find themselves competing against each other in a bike race that Kieran has been spending months training and preparing for. Kieran is in it for himself, he’s not associated with a team, but oh look, here’s the “great Niall” rising up again -taking the spotlight, being the team captain, winning all the accolades again. There is far too much rambling on about this bike race and the story really falls apart for me. The uniqueness of it, and the stunning prose can no longer rescue itself or keep my interest. It sputters to its end. The first half of this book was wonderful, it was exactly what I was hoping for, although, by the end I was glad to see it come to an end. This doesn’t mean however that I won’t be quickly reaching for Urquhart’s other novels. Her writing is sublime.